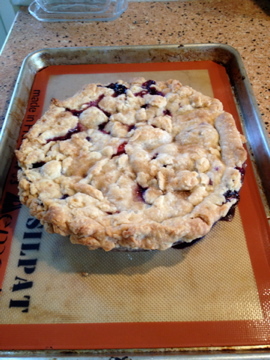 I’ve also never even eaten a blueberry pie (not a huge blueberry fan), but I loved the flavor. As for the nectarines…well, here in Portland, OR, we had such a cool wet beginning to our summer, the growing season is late. Thank goodness the filling was cooked, because it was impossible for me to find enough nicely ripe nectarines, so they were on the green side. Cooking definitely helped. I wasn’t going to post a photo this time – my finished pie looked a little like a train wreck, but I decided you have to post the bad as well as the good. And, I’ve decided this is the pie crust I’m going to workshop – I’ll be posting again in about a week to let everyone know if I get better at it or should just stick with cobblers! Well, let’s see…the sponge went OK…the first rise was a wee rise at best…and the second…well, not exactly what I would have hoped for. But, since there was no color photo in the cookbook to compare it to, I googled “semolina bread.” And, lo and behold, the loaves looked remarkably like the loaf I produced! Initially, I worried that baking bread in the middle of summer would create a miserable kitchen. But, unlike many of you folks in the midwest and eastern part of the US, Portland, OR is enjoying a delightfully sunny, yet comfortable summer, thus far. Today is a blissful 78 degrees with a light breeze and baking in my kitchen is truly glorious! I loved the ease and lack of work this bread was – I would consider making it on a spur of the moment, any day of the week. Funny story as a baking digression: I’m having my living and dining rooms painted. About 20-minutes into the bread’s bake, the aroma wafted into the room where I was sitting and all I could think was, “Wow, that’s the best smelling paint, ever! 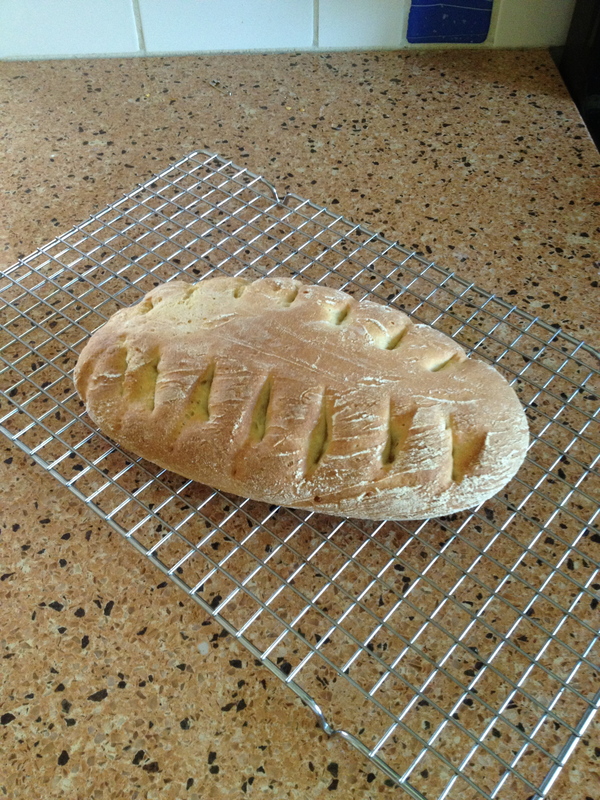 It smells just like bread baking…” Oh, the memory of a peri-menopausal woman!